Delhi people are going to thank the 2010 common wealth games for the facilities they are going to get in the city till 2010.Public transport system which has been a nightmare for the Delhi'ites till now with the fully packed buses,typical rickshaw wala's charging more if you look new and auto drivers who can blow out your screw's. Keeping this in mind,Delhi government started building the flyover's to make the traffic move faster.Even though it increased the traffic speed a bit,still the buses are packed with increasing population.Delhi government came up with Delhi metro[ the first of it's kind in the country ].Delhi metro i say is success,With people welcoming it by keeping the train clean and not pampering with train's material.Even though Delhi metro was looking good in the start,But with increasing commuter's in it.It's also getting wholly packed.It even stop's sometimes in the tunnels these days bcoz of the rush of the people. 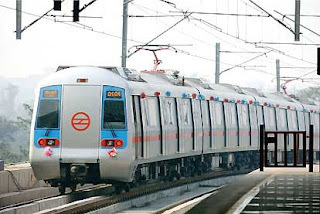 With all these planned transport systems coming into implementation,Delhi will be surely on the move.Ain't it?? ?